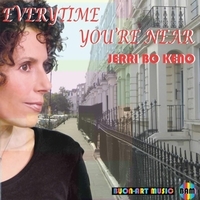 Bacharach styled wistful love theme from 60s Swinging London Film Soundtrack, Kiss Yesterday Goodbye, sung by Jerri Bo Keno, written and produced by Peitor Angell featuring Ron King on Trumpet, Alan Caplan on Trombone and John Yoakum on Woodwinds. Written, arranged and produced by Peitor Angell from his score for the 60’s Swinging London Motion Picture, KISS YESTERDAY GOODBYE, this recording of the Bacharach styled wistful love theme from that picture, features Brill Building Svengali, Phil Spector’s protege, Jerri Bo Keno on the lead vocal. Her first single, “Here It Comes and Here I Go” was written and produced by Spector at the time she was also recording with John Lennon and Cher. Jerri Bo Keno came across this song when she was listening to the soundtrack of Kiss Yesterday Goodbye and decided she would like to record the song herself. She contacted Peitor Angell and flew out to the West Coast from New York to record the vocal under his direction. With a wistful approach he felt was warranted for the song, in the vein of Dusty Springfield or Sandy Shaw, they proceeded until they found the right direction for Jerri to make it her own. Backed with the great West Coast players, Ron King and Rick Baptist on trumpets, Alan Kaplan on Trombone leads, John Yoakum on the alto flute and Tenor Sax step outs, Kathleen Robertson, Susan Chatman, Nicky Garcia, Cameron Patrick, Miriam Mayer and Peggy Baldwin on strings , Tom Bethke on guitars, Peitor Angell on keys and vibes, Kirk Smith on Bass, Paul Baker on Harp, Christian Moraga on Percussion, Jerry Kalaf on dumrs, and M B Gordy on Orchestral Percussion. The single was Recorded and Mixed at PeitorVision's Music Center of the World, Hollywood U.S.A.